It doesn’t seem possible we are already a month into fall and that the holidays are approaching like high speed trains. Goblins will soon be knocking at your door, and when they do you’ll want to be prepared where pets are concerned. No one knows your pets better than you do so before the night arrives, it helps to think about how they will react to the strange sights and sounds that abound on Halloween. You might need to be especially vigilant about a pet that is new to the family, until you see if he is frightened or likes to join in the festivities. Regardless if your pets enjoy wearing their own costumes or prefer a quiet corner away from it all, here are a few thoughts to keep in mind to help keep them safe. *While doors are opening and closing often make certain pets can’t escape. While it’s never a good idea for them to be running loose, it’s important to keep them inside on Halloween night. Pets left alone outside can become the victims of cruel pranks. *As an extra precaution, you might want to keep outside cats inside for a few days before and after Halloween. Many shelters do not allow black cats to be adopted at this time, simply to prevent them from falling victim to cruelty. It’s a sad but true fact that cats are often abused just for fun. *If they are frightened of or become aggressive at the sight of costumed children, it’s a good idea to keep pets secluded while you’re handing out the treats. Putting them in another room with the door closed and a radio or TV on can keep them from getting too upset and putting themselves or someone else in danger. *A short walk earlier in the day, if possible, might be a better idea than trying to walk while neighborhood streets are busy. *If your dog likes to accompany the trick or treaters in your family make sure he is on a leash and wears a reflective collar or something that will make drivers aware of his presence. *If you do dress your pets in costume, make sure they fit and are comfortable and will allow pets to relieve themselves without problems. *Keep all candy, especially dark chocolate, out of reach of pets. Have a few special treats just for them to enjoy while others are sampling the candy. Since Halloween falls on a Friday this year, please be aware and alert the entire weekend for any dangers that might befall your pets. For other tips on keeping pets safe on Halloween, or on any holiday, please check out the website, http://www.pet360.com. Have a fun and safe Halloween with your pets! 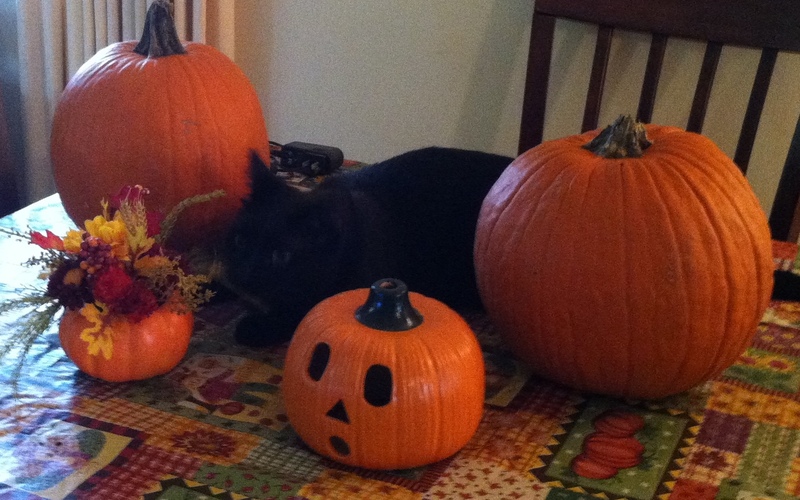 Tags: Fright Night, Halloween and pets, pets and Halloween., Safety tips for pets.